We specialize in disassembling salvaged cars and trucks into used parts and exporting them in containers from the U.S. to countries all over the world. The export market consumes engines and transmissions, steering gears, and sheet metal including doors, hoods and clips. Clips come in many forms: Front cuts, whole front ends, back ends or half of an entire vehicle. A&A Midwest Auto Wrecking also harvests wheels, radiators, batteries, catalytic converters, copper wires and tires for recycling. The remaining items, such as steel and plastic, are sent to shredders with very sophisticated sorting equipment that separate the various commodities for recycling. When a vehicle can no longer be operated due to an accident or mechanical problems, it’s time for it to be sent to an automotive wrecking facility. 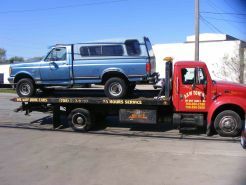 Tow trucks arrive daily at A&A Midwest’s Auto Wrecking facility in Blue Island, Ill. for end of life vehicle processing. 1) Every vehicle is carefully inspected before it’s removed the truck to assess its value. We look at the condition of the engine, catalytic converters, aluminum wheels, etc. Every vehicle is purchased based on the value of the parts that can be salvaged from it. 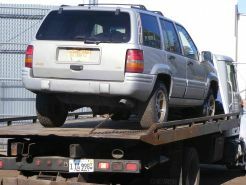 2) After the vehicle is taken off the tow truck it’s placed into our raw car inventory. 3) When the vehicle is ready to be recycled, it’s taken from inventory and delivered to our drain station. Here all vehicle fluids (gas, oil, transmission, etc.) are drained and recycled following strict state and local guidelines. Batteries are also removed and recycled. 4) Next is the cutting area. Where all metals are removed, such as the catalytic converter, radiator, and condenser. 5) From there, the vehicle will go in two different directions. Crushed – The vehicle’s motor, transmission and other parts will be removed and the whole vehicle will be crushed. Salvaged – In addition to the motor and transmission, specific parts will be removed such as tires, steering boxes, boosters, wiper motors, front ends, doors, hoods, rear hatches, etc. Sometimes only the front of the vehicle will be clipped and placed on a container for export. What we do with each vehicle is dependent on customer demand for the specific parts that will be salvaged for future use. Vehicles that are crushed will be stacked into one of our heavy duty trucks and driven to a nearby recycling facility to be shredded. An average load contains nearly 35,000 pounds of crushed vehicles. We typically ship six to eight truckloads per week. The shredder separates all the non-metallic parts, while the steel and other valuable metals are sent to be melted and used again. To serve the ongoing needs of our export customers worldwide, we ship our customer’s containers on a regular basis. The container helps fulfill specific requests from buyers for engines, transmissions and other parts. In addition, the front clip of several vehicles will typically fill the container. When our end-of-life vehicle processing has been completed, virtually no part of a vehicle is wasted. As a result, A&A Midwest Auto Wrecking can proudly boast that it is an environmentally “green” business.